Many robots and drones take their inspiration from nature, such as those that mimic our hand movements, or those that aim to emulate the athletic capabilities of a mountain goat. 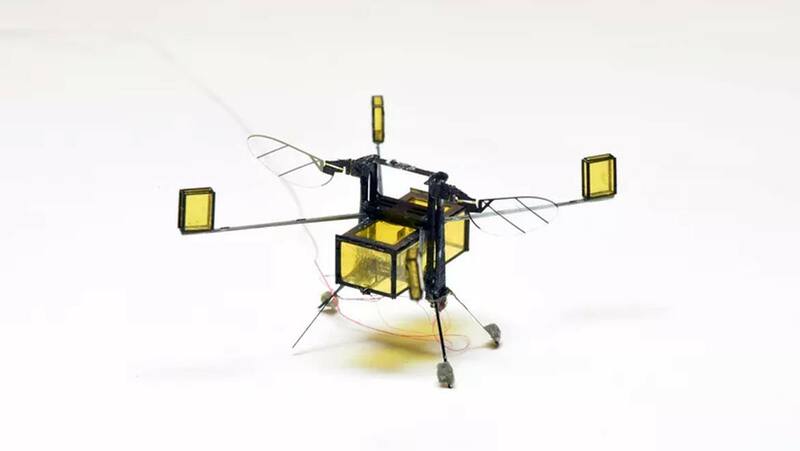 But now, Havard has just released details of the latest model of their RoboBee, and it seems as though its one step ahead of nature this time, for RoboBee can now both fly and swim. For the research team, based at the Harvard Wyss Institute and John A. Paulson School of Engineering, this was certainly a challenge to achieve. In order to do this, the team had to engineer RoboBee so that it could smoothly move from one medium to another, but that required significant adaptations in its design. The flapping speed of its wings had to adjust to the aerial or aquatic environment – because water is denser than air. This meant that if the flapping speed was too low, the RoboBee can’t take off, but if it was too high, the tiny wings would just snap off when it entered the water. Using a combination of experimental data and theoretical modelling, the team discovered that the optimum speeds of wing flap were 220 to 300 hertz whilst airborne, and 9 – 13 hertz whilst RoboBee was immersed in water. With that challenge out of the way, the next hurdle was how to help RoboBee break the surface tension of the water on entry and exit. Surface tension is more than 10 times the tiny 175 milligram weight of RoboBee. This problem was solved by using sharp edges to break the surface tension on the entry into the water, but a different technique was necessary for exiting. The solution was to fit RoboBee with four tiny floatation devices combined with a small gas collection chamber. Once RoboBee is sitting on the surface of the water, a small quantity of water is converted into oxyhydrogen, which is a type of gas fuel which allows RoboBee to break the suface tension and fly away. Again, this addition came with its own set of challenges, namely that the design of the microbot needed adjusting in order for it to carry the additional weight of the gas collection chamber. Cheng explained that this was achieved:“By modifying the vehicle design, we are now able to lift more than three times the payload of the previous RoboBee. This additional payload capacity allowed us to carry the additional devices including the gas chamber, the electrolytic plates, sparker, and buoyant outriggers, bringing the total weight of the hybrid robot to 175 miligrams, about 90mg heavier than previous designs. We hope that our work investigating tradeoffs like weight and surface tension can inspire future multi-functional microrobots – ones that can move on complex terrains and perform a variety of tasks.” Those tasks are suggested to include surveillance missions, search and rescue and environmental monitoring. The paper, titled ‘A biologically inspired, flapping-wing, hybrid aerial-aquatic microrobot’ is published in the October 25 edition of Science Robotics.